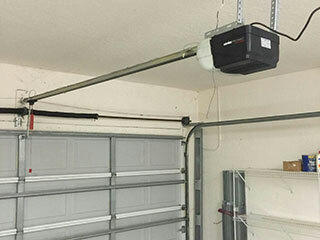 The opener is the motorized unit that allows your garage door to function automatically. As a result of it being an electro-mechanical device, there are a lot of different issues it can end up suffering from. Rest assured that no matter what type of problem you're dealing with, or what type of opener you have, our team can always provide you with an excellent solution. While there are many different manufacturers that are making quality products nowadays, some have risen above the competition in terms of reliability, affordability and added safety and security features. For example, the Genie Intellicode and the Liftmaster and Sears Security Plus, are both features that use rolling code technology in order to guarantee that your electric opener cannot be exploited by tech-savvy burglars. Chamberlain and Marantec are two more excellent brands that are known for the quality of their products. It is always better to get a name brand unit rather than a cheap - and most likely cheaply-made - opener. Whether your door stopped working due to a couple of worn out motor gears or some part of the opener's circuitry that's either fried or simply detached, you can count on our team to take care of it quickly and efficiently. We specialize in dealing with both mechanical and electronic issues that garage door openers can suffer from, and are capable of repairing or replacing any part of your unit. While there are a lot of different models for you to choose from, in terms of drive system function, garage door openers can be divided into three main categories. Belt drive openers are perfect for homes where the garage is close to a bedroom. These units are known for their smooth and quiet operation, but they can also be a tad more expensive than their counterparts. Chain drive models are among the most reliable ones out there. They are built to last and can perfectly handle heavy garage doors. Their main downsides, however, are the facts that they require more frequent maintenance and can be quite noisy when working. Last, but certainly not least, are the Screw drive units. These devices require very little maintenance and can continue to function optimally in extreme climates. They too can be a little noisy, however. Our team at Garage Door Repair Las Vegas can help you find the perfect opener for your home, or take care of any problem you may be experiencing without compromising your safety and without wasting your precious time. Contact us today to get the best professional assistance around.